When it comes to the cloud, many small and medium-sized businesses (SMBs) feel overwhelmed. In fact, in a recent AppDirect survey, 73 percent of SMBs said that there are so many cloud services on the market that they need help understanding all of their cloud technology options. SMBs may not understand all of the options, but that isn’t putting a damper on their desire to use for cloud-based solutions. Our survey found that 61 percent of SMBs overall want to use more services, but they need help determining which ones are right for their companies. Helping SMBs understand their choices and make the right decisions for their companies often takes multiple steps, including human interactions, across multiple channels, both online and off. While we believe this will change—as we’ll see later in this post, more and more businesses will feel comfortable with self-serve options in the future—the assisted sales model is still dominant today. Given this reality, what do providers need to do to help ensure that both their assisted sales and self-service efforts are a success? In this post, I’ll cover the fundamentals of assisted sales, and I’ll also walk you through a user experience audit framework to help optimize your self-service approach. Even though SMBs are becoming more knowledgeable about technology, as we’ve seen from our research, SMBs need help choosing the right cloud business solution. There are more than 10,000 business apps currently on the market, so the decision can be particularly difficult for SMBs since they are short on time and can’t afford to break any of their existing systems and disrupt their businesses. In other words, they can’t afford to make a wrong choice. Self-service sales do play a critical role in scaling your cloud business, but you need the human touch to help your prospects feel comfortable enough to buy, and to nurture meaningful long-term relationships with them when they become your customers. High-touch assisted sales can pay big dividends, especially as you introduce your cloud service offerings to your customers. Evidence for the importance of the human touch is everywhere. We see it across the software industry, where a growing number of leading SaaS players are hiring armies of customer success managers to drive direct customer engagement and maximize the value customers receive from their solutions. We also see it in the data from our own AppDirect marketplace insights, where 90 percent of first-time transactions worldwide require some type of live assistance, either from a sales or support representative. Selling cloud successfully means more than just a one-on-one phone conversation. It requires a different mindset, one that goes beyond just selling gadgets for example, where you can concentrate on selling on speeds and feeds without much empathy for customer problems and a general lack of customer focus. 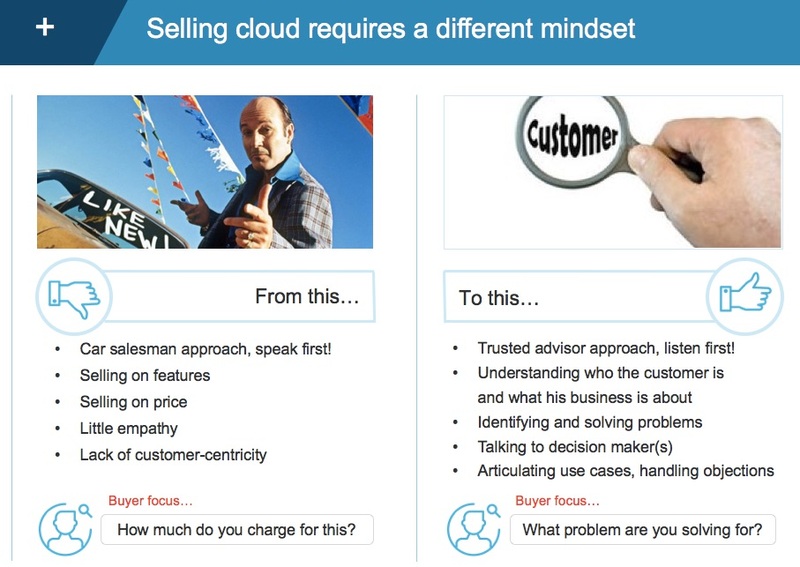 To effectively sell cloud-based business applications, sales teams must become trusted advisors and pay attention to the customer. The salesperson must ask questions to understand what the business is about and what challenges a company may be facing, not with the prime objective of closing the sale, but with the aim of solving business problems. In my experience, telecom companies provide a good example of the contrast between these types of selling approaches. At many telcos, leadership and sales team members may talk about becoming solution sales providers, but in reality the nature of the telco sale is still very transactional: Basically, you show me your bill, and I’ll tell you what I can do for you. Given this, we recommend creating two layers in your sales organization. The first layer—your front-line sales team—should act as a lead generation engine for the second layer, which is the solution specialist team. 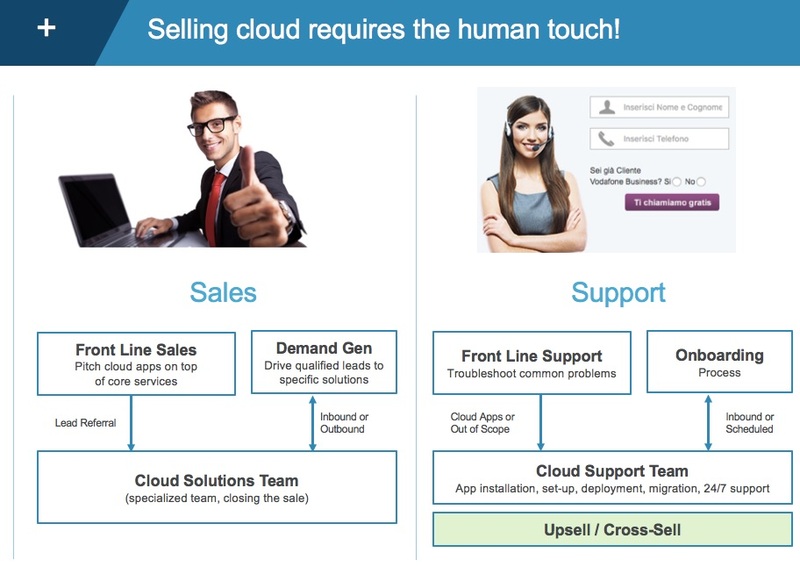 This tiered approach simplifies what can potentially be a complex sales conversation. The front-line team can articulate a 30 second pitch around a small set of cloud solutions that you know will resonate with your customers. Then, the front-line team can hand over customers to the solution specialist team, whose objective will be to close the sale. When it comes to implementing this type of overlay sales approach, you have two options: The first is to hire a solution sales coach who will spend three to six months with your sales team. The coach can identify the 10 percent of your team who can stretch, and from this group form a small tactical team that will be ramped up gradually to learn the ins-and-outs of selling your specific cloud offerings. No matter which approach you choose, you will also need to consider how to incentivize your sales team. Incentives do help to drive sales activity—after all, they drive sales people to do what they do best—sell. However, it’s also important to keep in mind that, while incentives will drive sales, there are some pitfalls that are unique to SaaS. Your team shouldn’t sell seats just to drive big numbers; if customers doesn’t activate their seats, they will feel as if they have been misled and are not getting the value they were promised. This also means they will most likely churn, and your team will miss an opportunity to make upsells or cross-sells down the line. Your incentives should be attractive, but rather than based on pure sales numbers, they should be based on activation and usage. Reframing your incentives in this way challenges your sales teams to do two things. First, it will motivate them to position the services correctly, which includes articulating the business value and identifying the need that it addresses. Second, it will push sales teams to follow up with customers to make sure that they have engaged with the onboarding team, since they won’t get paid unless the customer is active. Online self-serve sales will help establish a solid foundation for future organic cross-sell and upsell opportunities through the platform. Across our ecosystem, we already see about 15 percent (and growing) of our first time subscribers upselling and cross-selling organically through online marketplaces, completely on their own, which ultimately will help offset your initial investment in assisted sales. To help customers find, buy, and manage cloud-based business apps on their own, it is critical to nail down your end-to-end customer experience. 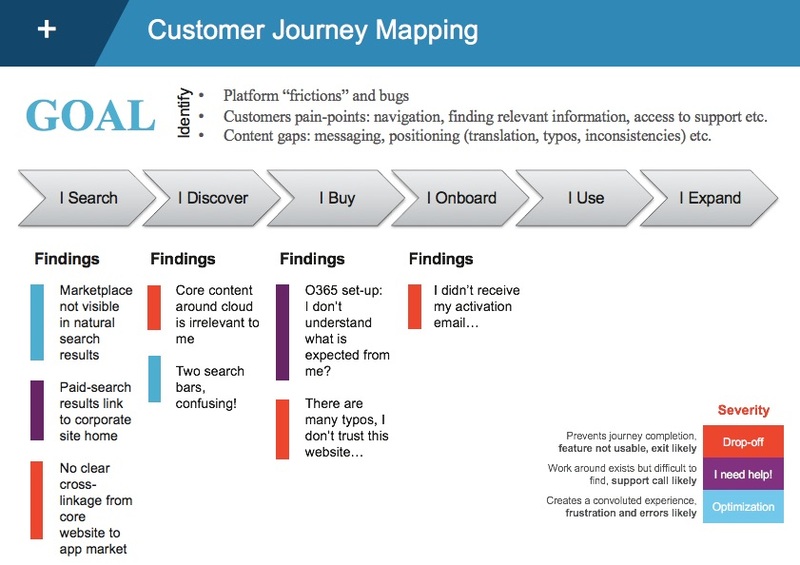 AppDirect has developed a comprehensive customer journey mapping framework that helps capture, consolidate, and structure end-user pain points—such as bugs, typos, usability issues, gaps versus expectations, and more—at each stage of the journey, from search, to discovery and consideration, to purchase, onboarding, and usage. This framework has been utilized across multiple AppDirect customers to audit and benchmark their marketplace experience against our ecosystem best practices, the objective being to identify and prioritize gaps, and build an improvement plan (see below example). There is no silver bullet that will solve the customer experience: Every single piece of interaction is important and any miss at any point in the journey can derail your customer from buying. For example, sending a confirmation email including end-user credentials to a “secondary” email address that your customer doesn't use. Consistency is key: Make sure design and language are consistent across the entire journey, including landing pages, the marketplace, top navigation across web properties, email communications, etc. Content is king, be ready: In today’s market, customers expect to have access to information at their fingertips. Be sure you’re ready with clear value propositions, case studies, videos, customer testimonials, app profiles, plans and pricing, reviews and ratings, FAQs, and more. Customers expect your support: Be ready to help your customers at any stage. Never hide behind a generic email address, and be sure to build a marketplace-specific support section and offer access to chat and / or phone options on every page. While it can be time-consuming, organizing a customer experience workshop with key stakeholders from across the organization is the best way to raise awareness on mission-critical aspects of the journey. These can include diverse areas, such as content marketing, customer support, payment options, customer lifecycle communications, and more, which makes aligning teams on gaps and priorities even more important. Do you have questions, or are you looking for advice about implementing these sales strategies? We’d love to hear from you. Christophe Girault is the Global Customer Success Evangelist at AppDirect.